Every month on the fourth Friday. Hosted and music by Lance's Cruzin to the Hop. Trophies, prizes and lots of fun. Every Friday. Hosted by the Asphalt Angels. There's muisc, door prizes, and raffles, plus nine restaurants, a cinema house, and lots of shopping. Every month on the fourth Friday. Open to all years, makes and models of trucks. Happy hour 4-7pm. Ace Cafe is THE place for all things cars, bikes and rock n' roll. With a full-service restaurant, art gallery and live music; there's something for everyone. Plus it is dog friendly. Welcome to the MOST partyin, fun, BEST value classic car weekend on the circuit! If you are looking for a fun, relaxing weekend on the beach to meet other gearheads and have a BLAST at the beach, THIS IS IT! Are you used to paying $30 to show your car for a day and get a T-shirt? At Burning Up the Beaches you get armbands for 2 people, to 3 parties with live music, prizes galore, 5 fantastic stops, dinner on Saturday night, event decal, one event t-shirt, and car show all for the $80 tax deductible dollars. We are seeking approximately 10 to 20 nice cars and or motorcycles for display purposes at our MoMENtum Men's event. Grilled hamburgers & hot dogs will be provided free of charge for all display owners. You are invited to attend the evening event and enjoy the positive and encouraging messages shared by our guest speakers. We are of the opinion that men need all of the encouragement we can get in the days in which we live. You can register for the evening event on the website. Every month on the first Friday. All vehicles are welcome, and there's three Tavern Choice awards, a 25% participant discount inside the restaurant, and hamburgers, hot dogs, and cold beverages available outside. Every month on the first Friday. Hosted by the City of Lake Worth. Open to all cars, trucks and motorcycles. There will be bands and DJ Groove from Spin 88.7 fm. Kids bounce houses, beer garden, restaurants and trophies for the Top 30 Best of Show. Motorcycle awards at 9pm will include: Best Touring Dresser, Best Classic Chopper, Best Pro Street, Best Late Model Indian, Best Custom Chopper & Best 3-Wheeler, plus the NEW Ladies Choice award. Car awards at 9:30 will include: Best In Show, The People's Choice, Best Chevy, Best Ford, Best Mopar, Best GM, Best Corvette, Best Mustang, Best Camaro, Best Classic, Best Chevelle, Best Impala, Best Thunderbird, Best Truck, Best VW Bug, VW Van, Best Rod, Best Exotic, Best Mods, Best Interior, Best Paint, Best Engine Hub, Long- Distance Participation Award & Best Club Participation Award. Every month on the first Friday. Open to all years vans, campers, and trailers . Happy hour 4-7pm. Ace Cafe is THE place for all things cars, bikes and rock n' roll. With a full-service restaurant, art gallery and live music; there's something for everyone. Plus it is dog friendly. Every month on the first Friday. 365 JeepLife will be showing off the lights and big wheels every month on the first Friday. Open to all Jeeps. Rain or shine. Ace Cafe is THE place for all things cars, bikes and rock n' roll. With a full-service restaurant, three bars, a giant outdoor patio, gourmet coffee cafe, art gallery and live music; there's something for everyone. Plus it is dog friendly. Event month on the first Friday. Enjoy great food and drinks while cruisin' down memory lane and see the most well-known classic cars of all time. DJ music, raffles, food and drink discounts. Open to all years, makes and models. Cruise located along Dakin Avenue. Every month on the second Friday. Open to all makes of cars and trucks. DJ John Paul Gasca will be spinning the hits from retro to right now. Cruisers and passengers receive a discount on menu items from 4-8pm. Bring your classic car, show car or truck down to a real old school drive-In. Will see you at Mike’s. Every month on the second Friday. People's choice awards. Every month on the second Friday. 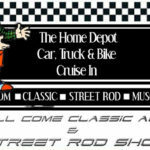 Presented by Precision Auto Works and Aliseo Classic Car Sales. This is a FREE cruise in with trophies, DJ music, food trucks and more. Every month on the second Friday. Open to all years, makes and models. Happy hour 4-7pm. Ace Cafe is THE place for all things cars, bikes and rock n' roll. With a full-service restaurant, art gallery and live music; there's something for everyone. Plus it is dog friendly. Every month on the third Friday. There are numerous shops, restaurants, pubs and more on the square for you to visit and there is 50's - 60's music as well. Every month on the third Friday. Weather permitting. Open to all years, makes and models of vehicles. This is a family community event and is very children friendly. Award winning BBQ and more for all to enjoy. Y'all come on out for a evening of family fun, hot cars and the greatest folks in the world.